Now available to order at Vospers. Discover the All-New Mazda3 Hatchback. Combined with our latest SKYACTIV engines and technologies, this is the beginning of a new era for Mazda. All-new Mazda3 features finely honed elements creating clean, beautiful designs with sophisticated and elegant styling giving a natural and dynamic feel. The All-New Mazda3 hatchback strikes you with its powerful, seductive presence and strong sporty appeal. It is designed to make you feel you’re looking at a work of art – not just a car. The way light plays on its flowing lines gives the impression that it is moving, even when standing still. The all-new Mazda3 hatchback focuses on creating a powerful form that conveys a fresh approach to hatchback styling with the cabin and body coming together to appear as a single solid mass from the rear, creating a powerful and seductive look. Within the interior of the all-new Mazda3 lies an 8.8-inch wide centre display, offering simplified operation via commander control. Mazda's MZD Connect system also includes a Digital Owner's manual as well as other functionalities including DAB radio, integrated Bluetooth® and Mazda Navigation System. All-new Mazda3 is also available with Mazda's newly developed Driver Monitoring system, using infrared camera and LED to observe drivers condition whilst driving to determine levels of drowsiness or fatigue. Front Cross Traffic Alert (FCTA) also uses front side radars to detect other vehicles approaching from blind spots whilst Cruising & Traffic Support assists with the accelerator, brake pedal and steering operations. 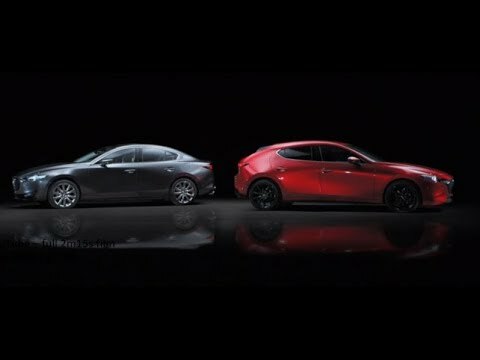 All-new Mazda3 are the first engines to feature Mazda's new innovative Skyactiv-X Spark Plug Controlled Compression Ignition engines, featuring superior initial response, powerful torque, faithful linear response and free-revving performance. The all-new Mazda3 has redesigned petrol engines, including a 2.0 litre version of the latest Skyactiv-G powerplant, with optimised intake port and piston shape, split fuel injection and a coolant control valve to deliver higher levels of dynamic performance, fuel economy and environmental friendliness. A Skyactiv-D 1.8 diesel engine is also available with ultra-high-response multi-hole piezo injectors equipping the engine with high-pressure, precisely controlled multi-stage injection.